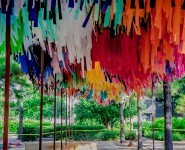 The Color Condition considers the idea of “play” throughout Arcade, which consists of three separate installations that create a dialogue between parts of the Avenida Houston campus. 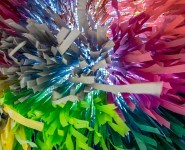 The works — made from strips of table cloths, shower curtains and painters drop cloth — respond to the environment, creating new colors as the light changes and new patterns with each gust of wind. 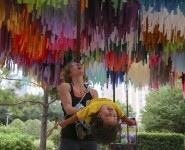 This is the artists’ Houston debut and their largest commission since The Color Condition was established in 2010.